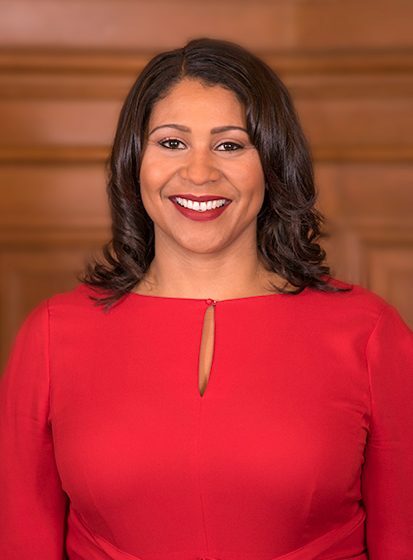 London Nicole Breed is the 45th and current mayor of the City and County of San Francisco. She was sworn in as mayor on July 11, 2018. Breed is the second woman overall to be elected mayor of San Francisco. She formerly served as supervisor for District 5, and was president of the Board of Supervisors from 2015 to 2018. She was elected to the Board of Supervisors in 2012 (taking office in January 2013), and elected its president in 2015. As president of the Board, Breed, according to the city charter, became the acting mayor of San Francisco following the death of Mayor Ed Lee. She served in this role from December 12, 2017 to January 23, 2018. Born in San Francisco, Breed earned a bachelor’s degree from the University of California, Davis in 1997 and a master’s degree in public administration from the University of San Francisco in 2012. Breed’s best-known environmental work is likely her successful fight to launch the city’s clean electrical energy program, CleanPowerSF, a Community Choice Aggregation program in which San Francisco purchases renewable, greenhouse-gas-free electrical energy and makes it available to San Francisco ratepayers. Its ultimate goal is to achieve 100% clean electrical energy in the city. Copyright © 2017 SF-Bangalore. All Rights Reserved.